During formation of highstand systems tracts, sea level rise reaches a maximum height, the inundaformted self has continued prograding and carbonate sedimentation and accumulation has reached a maximum. These highstand systems tracts have the sediment character shifting seaward and landward, with sediments being deposited onto the slopes receiving an increase in carbonate from the excess shelf carbonate accumulation. Sea level rise also shifts carbonate transport further out onto the slope increasing the surface area onto which the sediment may be deposited (Handford and Loucks 1993). As highstand progresses the on-lap at maximum transgression or highstand often leads to sediment starvation and the deposition of pelagic and hemi-pelagic shifting to an apparent off or down-lap leading to the initial phases of a falling stage systems tract (FSST). Click on image below to see a quick time movie of the response of carbonate accumulation to sea level explained above. 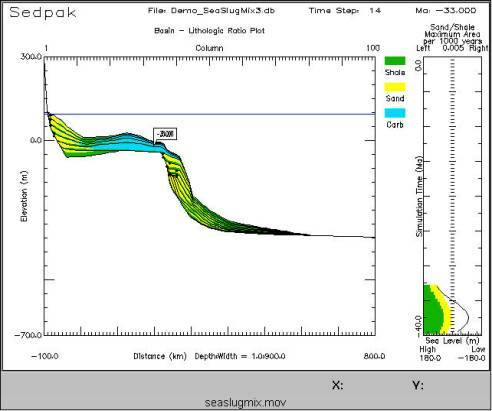 Cross-section depicting a normal sedimentary sequence at sea level highstand HST formed by a Sedpak simulation.